My only regret about this book was not reading it sooner. 17 year-old Cassel Sharpe is the black sheep of his mafia crime family. While they're mostly small-time con artists, they all have a special talent - they have the power to curse - meaning they can change your memories, kill someone, manipulate memories, or gain unusual strength by touching their target, or "mark" with their hands. Only Cassel seems to lack any special abilities. Because of the danger, it's a commonly accepted practice for everyone to wear gloves at all time. Such power doesn't come without a price, however. Curseworkers suffer from "blowback" directly related to their ability. The more the power is used, the more one suffers. Deathworkers suffer from rotting limbs, and nearly all accomplished hitmen are missing fingers, toes or maybe an ear. Emotion workers like Cassel's mom suffer from wild mood swings, and so on. For reasons that even he doesn't fully understand, Cassel is harboring an awful secret. Three years ago, in a fit of jealous rage, he murdered his long-time crush, Lila, the daughter of a powerful mob family. His older brothers Philip and Barron helped him cover it up, and have enrolled him in an exclusive private boarding school to keep him out of the way while his mother serves out a prison term for bilking lonely widowers out of their money. Cassel is such an interesting character. He desperately wants to fit in, to be normal and liked, and yet, he's filled with so much self-loathing, he's always uncomfortable in his own skin and awkward around people. He spends half his time wishing he could cut himself free from all of his family ties and resents being drawn in to their schemes and crimes, but half the time he wishes that he would prove to be a late-bloomer and fantasizes about developing paranormal powers of his own so that he could be included with his brothers in their illicit activities. Cassel is surrounded by family who pride themselves on fooling others, and he's been taught since he was in his cradle to guard his true feelings and how to be an effective liar. 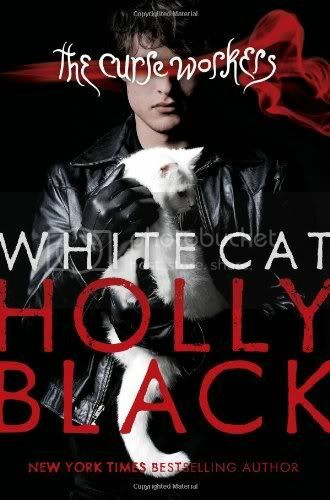 Things really get rolling when Cassel sets up a small-time betting operation at his school, his mother is released from prison, he begins sleepwalking, and having intense dreams about a white cat that follows him everywhere. There are some stunning twists and turns, and some major plot reversals at the end of the book that I never saw coming. I highly recommend this book. hmmmm...I heard this was a good book but just kept skipping over it. I think now I need to give it a try. I really want to read this series. Almost every review I've read says the same things: MC is awesome and the twists and turns are amazing. Yes, for some crazy reason, I saw the cover and assumed this story would have more of a horror element. I loved the ending, and you have no idea how hard it was for me to write a spoiler-free review!